Quit goofing around on the internet. 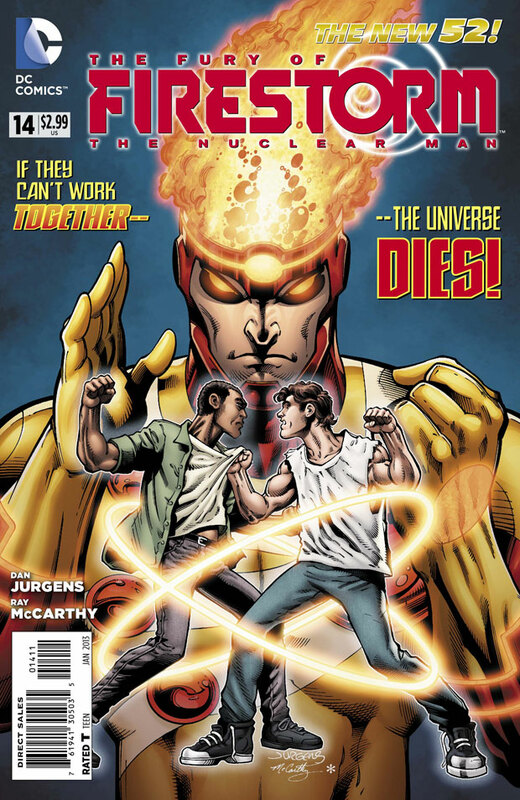 Go read The Fury of Firestorm: The Nuclear Man #14 in stores today! This issue features story and pencils by Dan Jurgens, inks by Ray McCarthy, colors by Hi-Fi, and lettering by Travis Lanham! This is the second issue with the all-new creative team and all-new direction. Be sure to pick up a copy and tell your friends to also! Let’s get out there and show our support! We’ll talk later. There’s lots to discuss. Be sure to leave your comments here! Posted in: Comic books, Dan Jurgens, Firestorm #10: New 52 v2 (Ronnie/Jason), Firestorm comic vol. IV, Jason Rusch, Ronnie Raymond. I’m really digging Jurgens’ take on Ronnie and Jason, their personal relationships with each other, their parents and Tonya, their whole life at school outside of Firestorm. This is great stuff, infused with the lighthearted fun that was promised with the creative change. On the other hand, I wasn’t impressed with the villain plot of this book. I don’t care about Dr. Megala or his cronies, or the Dataxen robot, or Captain Atom. The mad-scientist-and-hulking-robots thing has been done in so many titles that they all blend together; it takes a lot to make that threat seem fresh and new. Megala corrupting or possessing Firestorm would have seemed unique, except the first year of this title gave us darker, deadlier variations of the nuclear man. Meanwhile, Firestorm has some fantastic, visually dynamic rogues that I would love to see him take on in this series. Bring on Killer Frost, Typhoon, and that guy who ties ropes. This is awesome. Personally, I am a huge Captain Atom fan and have been since 87. I was so unhappy with the new series that I almost didn’t shed a tear when it was cancelled. I did complain, “Oh, Captain Atom gets cancelled but Firestorm gets Dan Jurgens? Where’s the justice?” But when I heard he’d make an appearance in The Fury of Firestorm: The Nuclear Man, I was elated. Because at least I got to see what Jurgens would’ve done with the character. Not much to go on so far, but he LOOKS a thousand times better than the Freddie Williams, II Captain Atom. I don’t want to knock the guy because he can still draw better than I can, but I wasn’t digging his style. I mean, I didn’t even get that Eiling was African-American. I was really yelling at my iPod when I was listening to your speculations of who the wheelchair guy was in episode 34 of Fire and Water. I mean, you knew Captain Atom was on his way. Did you never read his series? I’d have thought you would have picked up on the fact that it was Dr. Megala. You DID read Cary Bates/Pat Broderick Captain Atom, right? And not just for the Firestorm guest appearances. Okay, that aside, I’m really digging what Dan is doing with Firestorm. So happy he’s back to a sort-of version of the Firestorm of my youth. I miss Professor Stein, but Jason is kind of a good replacement I guess. I mean, Stein was sort of a father figure for Ronnie, even though he had a dad. With the New 52 Ronnie’s Dad out of the picture, Professor Stein would make even more sense now. But I’ll take what I can get I suppose. Skull Crusher (eh) in a bunny suit. Cute. But why no Killer Frost? Dr. Megala as a villain? Well he was always an anti-hero at best. The art? God bless you, Dan Jurgens. The story? Pretty good. I could care less about Jason & Ronnie’s parents dating, but it could make for some interesting subplots. Still, overall, awesome issue. Awesome series. Bring back Killer Frost. Use Captain Atom more. And give that fish guy a guest shot. I feel this is by far the best issue in the series thus far. The new team seems to have a clear focus and an interesting direction for the character. There was some actual science in the book which is a must for the Nuclear Man. I’m excited for the first time in this season, which is about time since I’ve been buying this for two years now. A fun issue. Loved the bit with the bunny costume. Was surprised with Megdala (sp?) taking over Firestorm’s body? What happened to Ronnie and Jason? 1) how did Ronnie get to Jason’s house so quick after Jason JUST experienced the pain. Is Ronnie more susceptible to it? 2) when they turned into Firestorm and flew off to find answers, where exactly were they going? Star Labs, maybe? I hope there will be repercussions to Tonya writing Ronnie’s paper. I think Ronnie’s teacher strikes me as smart enough to be able to tell that Ronnie didn’t write his own paper. See, that’s one of the things that made the old series work that needs to be reincorporated into the new series— subplots that involve the *civilian* identities, not just those involving the hero at large. I’m glad that in the new reality Jason’s dad is a good dad and not a child-beater. That’s because the book has some balancing to do when it comes to its presentation of people with disabilities. The evil mad scientist in a wheelchair lashing out at the world is a tired negative stereotype. Though he is an echo of Henry Hewitt from the original series. One thing— so far, it seems that Ronnie and Jason have to be in physical proximity to become Firestorm. That will eventually become an albatross around the neck of the series. They should return to the idea from the original series that they don’t need to be in proximity to form Firestorm.